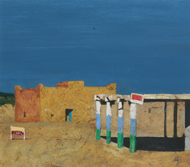 Over 40 years, new paintings about New York, Pairs, Sharm el Sheikh, Montalbano. Around 60 tablet of works related to the years 1968, 1975 and from 2007 to 2010. 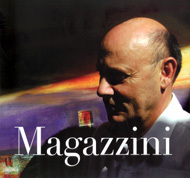 In occasion of the celebrative exhibition “40 years of painting”, Salvatore Magazzini personally took care the volume-catalog. From Edoardo Bianchini’s introduction: The presentation of a catalog of this kind has to be like an obelisk, an emotional synthesis-revival, a hymn to the pulverized time, a shout to the passing of the barriers of time through the magnificence of the art, which is worthy of talking by itself- without futile words; if not those thrilling aroused from the feelings, instinctive like the sense of paintings present in Salvatore’s veins. The profit coming from the catalog selling has been entirely devolved to the “Filo d’ Oro” (association for those people unable to see or listen). Un libro necessario per conoscere o per non dimenticare l'arte scultorea di Magazzini, arte preziosa e molto cara all'artista ma i cui frutti sono dispersi in varie collezioni private. Inoltre, per rendere ancor più importante l'evento della pubblicazione, l'artista offrirà ai suoi estimatori un piccolo acquarello firmato inserito fra le pagine del volume. 88 pagine - 66 pagine di fotografie - testi di Edoardo Bianchini, Mario Luzi, Dario Olivi. The artist has taken care of the book himself in order to offer to his beloved estimators a testimony of over 30 years of artistic work. Within the book are reported critics that have been accompanying the artist’s exhibitions, essays, biographic notes, and shows held in Italy and abroad from the first debut until now. Above all, the volume gathers a great selections of works which cover a span of time from the youth to the present days.